Too often lunging is seen only as a tool to get the "crazies" out of a horse before mounting up. It's so much more than that: lunging can teach both horse and rider valuable lessons to further their riding partnership. First and foremost, lunging can teach a young horse how to carry himself, and eventually how to balance a rider. Traveling in circles within a horse fence puts a natural bend in a horse's body, and a horse can learn to stretch down and out without the distraction of a rider on his back. Lunging is an excellent tool to teach a horse the verbal commands of talk, trot, and canter, and as long as the horse is worked evenly in both directions, lunging can help to build up his muscles and prepare him to support a rider. Additionally, lunging can teach a horse to maintain a steady pace and stride length. To check your horse's striding, place a ground pole and lunge your horse in a circle so that he travels over it during each rotation. Each time your horse travels on the circle, he should take the same number of strides before stepping over the pole. Placing additional poles in the circle can help to teach your horse to collect or shorten his stride. 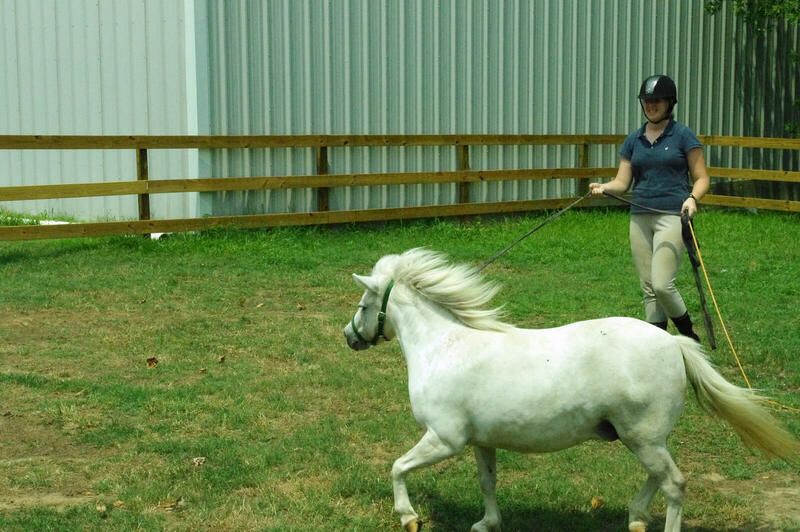 A lesson on the lunge line can teach a rider vital skills. When working on the lunge line your trainer can control the horse inside the ring, leaving you to focus on your own position and balance. Work on the lunge gives you the opportunity to ride without holding the reins, and exercises like riding with your hands stretched up above your head or placed on your shoulders can help you to develop better balance and an improved seat. Lastly, lunging can help to settle your horse before riding him. It can be used as a tool to warm up his muscles and gives him a chance to travel in a long and low stride before introducing the weight of a rider to his back. If your horse has excess energy, he can safely expend it while on the lunge line without putting your safety at risk. A few minutes of lunging can help your horse to settle down and focus, making the beginning of your ride more pleasant and productive than it might have otherwise been. Working on the lunge line can help both you and your horse to improve the foundations upon which good riding is built. It's a solid training tool, and can help to prepare a horse before a ride. This entry was posted in Horse Riding. Bookmark the permalink.